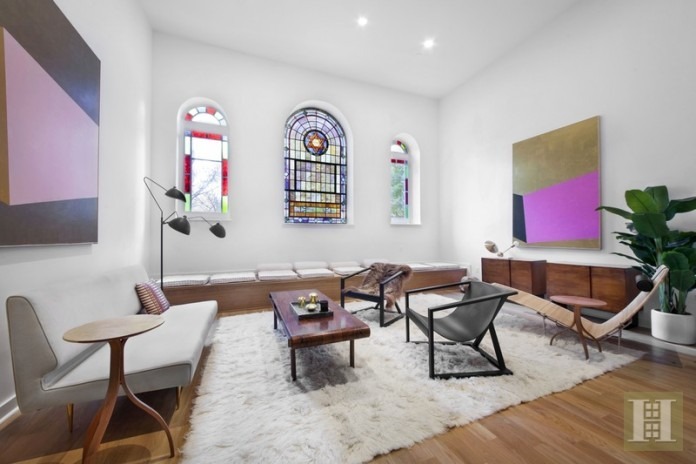 This grand three bedroom, three and a half bathroom condo at 44 Gramercy Park North (priced at $5.995 million) includes 14 stained glass windows in the living and dining rooms that all overlook Gramercy Park. 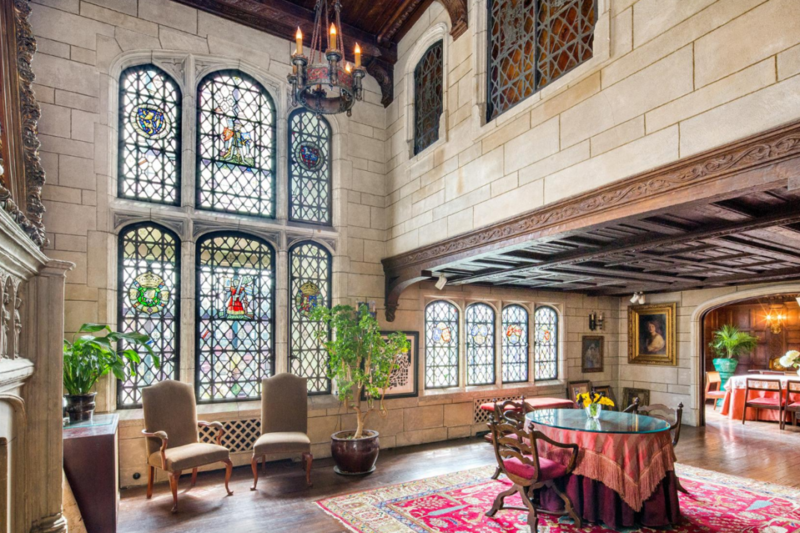 Long used as a decorative element in houses of worship, stained glass became more commonly used in private residences in the United States in the 19th and 20th centuries, decorating glass-paned doors, bay windows, skylights, and more and infusing homes with charm, color, and history. 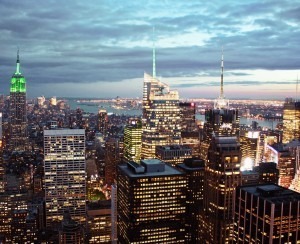 Here, a selection of New York City apartments on the market that feature this decorative art. 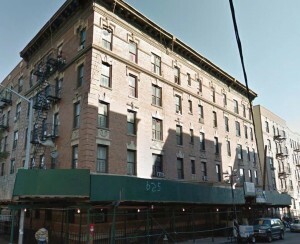 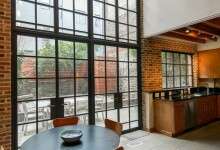 Located on the third floor of an East Village synagogue (the Adas Yisroel Anshe Mezeritz Congregation has the first floor along with its own entrance) this two-bedroom, two-bath condo at 415 East 6th Street (listed at $2.995 million) features a double height ceiling in the living room with three original strained glass windows. 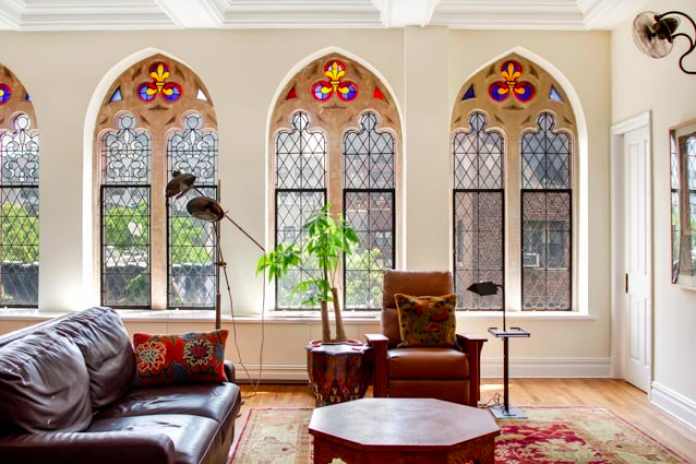 At 232 Adelphi Street in Fort Green, a three-bedroom, two-and-a-half-bath rental in a Gothic Revival Cathedral (yours for $12,000/month) comes with this 22-foot, arched, stained glass window anchoring the living room. 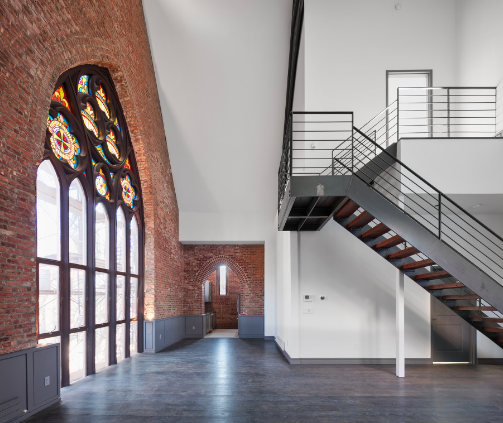 Similarly, this four-bedroom, four-and-a-half-bath condo in the former abbey of St. Georges Church at 205 East 16th Street (on the market for $6.35 million) boasts a grand living room with coffered ceilings and four stunning south-facing stained glass windows to catch and cast the light. 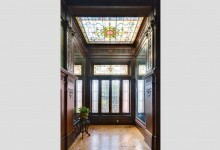 Who says stained glass can only be used in common areas? 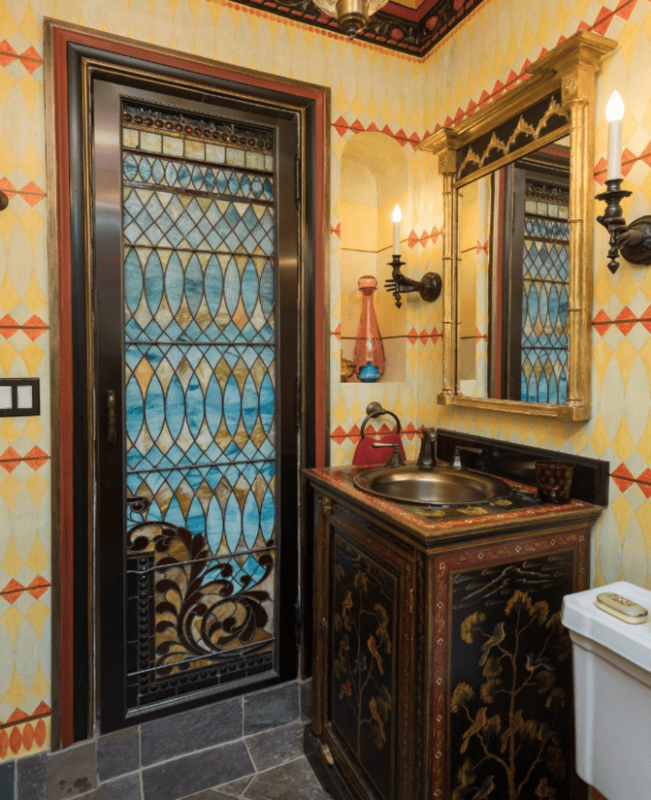 In this prewar two-bedroom, co-op at 130 East 67th Street (on the market for $1.8 million) a second bathroom has a stall shower complete with Tiffany-style stained glass door.